The aim of the present study was to determine Co accumulation pattern in bodies of mosquitofish (Gambusia affinis Baird & Girard, 1853) at differing flow rates and concentrations following a 180 hours of exposure period. Co values in each experimental group were determined by flame atomic absorption spectrophotometer (FAAS). We found no differences in the mean accumulated Co level between experimental groups. The pollution of aquatic ecosystems by heavy metals is an important environmental problem (Rayms-Keller et al. 1998), as heavy metals constitute some of the most hazardous substances that can bioaccumulate (Tarifeno-Silva et al. 1982). Bioaccumulation is a process in which a chemical pollutant enters into the body of an organism and is not excreted, but rather collected in the organism’s tissues (Zweig et al. 1999). Although some of these metals (e.g., Cu, Zn, Co) are essential trace elements for living organisms, they become toxic at higher concentrations. Some of these heavy metals were used as micronutrient such as cobalt (Co). Co is of relatively low abundance in the Earth's crust and in natural waters, from which it is precipitated as the highly insoluble Cobalt sulphite CoS. Although the average level of Co in soils is 8 ppm, there are soils with as little as 0.1 ppm and others with as much as 70 ppm. In the marine environment Co is needed by blue-green algae (cyanobacteria) and other nitrogen fixing organisms (Watanabe et al.1997). Co is an essential metal as an integral component of cyanocobalamin (vitamin B12) constituting nearly 4.5% of its molecular weight which is indispensable for animal growth.. Most animals need Co for vitamin B12 synthesis by intestinal microflora. Members of these intestinal flora have also been isolated from the intestinal tracts of fish (Kashiwada et al., 1970). Co, as a part of vitamin B12 is associated with nitrogen assimilation and synthesis of haemoglobin and muscle protein. It also influences certain enzymes, binds to insulin (Cunningham et al. 1955) and also reduces plasma glucose levels (Roginski and Mertz, 1977). Previous studies reported results on Co accumulation and their toxicity effect in aquatic organisms (Nolan etal 1992). Co acute to chronic ratios determined for Daphnia were 111 and 1163 in soft water and hard water, respectively (Diamond et al 1992) indicating large differences between acute and chronic effects thresholds. Co toxicity data also exist for several fish species goldfish (Carassius auratus), fathead minnow (Pimephales promelas), zebrafish (Brachydanio rerio), and banded gouramis (Colisa fasciatus) (Marra et al.1998). Baudin and Fritsch (1989) examined the related contribution of food and water in the accumulation of cobalt in fish. Carp fed Co-contaminated snails were found to accumulate Co only slightly. Marra et al (1992) reported that a clear dose-response relationship between Co concentration and mortality, although rainbow trout did not start dying in concentrations that eventually produced 100% mortality until after the first 2 days. Fish accumulated Co-cobalamine 21 times more rapidly from seawater than CoCl2 and retained ingested Co-cobalamine 20 times more efficiently (100 %) than ingested CoCl2 (5 %). Two thirds of the ingested Co-cobalamine was retained in the fish with a retenhon half-time of 8 d. The remaining one third of the organic form was retained with a half-time of 54 d, a value which was not significantly different from that of CoCl2 (47 d) (Nolan et al, 1992). On the other hand, very high doses of Co (0.1-5 g Co kg-1) were toxic to rainbow trout, resulting in haemorrhages in the digestive tract and alterations in white blood cells (Watanabe et al.1997). Co deprivation reduced the intestinal synthesis of vitamin B12 in catfish (Limsuwan and Lovell, 1981). The mosquitofish Gambusia affinis (Baird and Girard, 1853) is a member of family Poeciliidae (Poeciliids), subfamily Poeciliinae and inhabits standing to slow-flowing water; most common in vegetated ponds and lakes, backwaters and quiet pools of streams. G. affinis feeds on zooplankton, small insects and detritus and is used as live food for carnivorous aquarium fishes (Page and Burr, 1991). G. affinis is commonly present in the pond and streams near agricultural areas and also it is easy to maintain this species in laboratory (Öztürk and Ikiz, 2003, Güner, 2009). Since G. affinis is widespread, used for biological control of mosquitoes and also is an easy organism to be maintained in laboratory, we used this organism as the experimental animal and focused in this present study on mainly bioaccumulation of different consantrations (4000, 2000, 1000 ppm) of Co with different flow rates (0.5-1-2 ml//h) in animals with different exposure times (1, 12, 24, 36, 48, 60, 72, 84, 96, 108, 132 and 180 h). Mosquito fish, Gambusia affinis (Order: Cyprinodontiformes, Family: Poeciliidae), were obtained from Güllapoglu Lake Edirne and transferred in our controlled laboratory and kept in 100 l continuous aerated glass aquarium tanks for 2 weeks before experimentation in flowing dechlorinated (active carbon filtered) and aerated Edirne city tap water [Gülapoglu Lake water: Ca+2 40 mg/l, pH 8.0, 14°C]. The temperature, oxygen content and pH of the aquarium water were monitored daily. Animals were fed approximately 3% body weight per day (as three 1% meals per day) with a commercial fish bait (Pinar Fish Bait; Zn 70 mg/kg, Mg 25 mg/kg, Mn 25 mg/kg, Fe 2 mg/kg, Co 0.2mg/kg, wet weight). After a two weeks accustimation period in holding tanks (maintained at 21 °C, 12:12 h light:dark regime), 300 fishes were randomly transferred to three (50x50x100 cm, 100 l) glass aquarium exposure tanks which operated with static systems with continuous aeration (three experiemental groups). 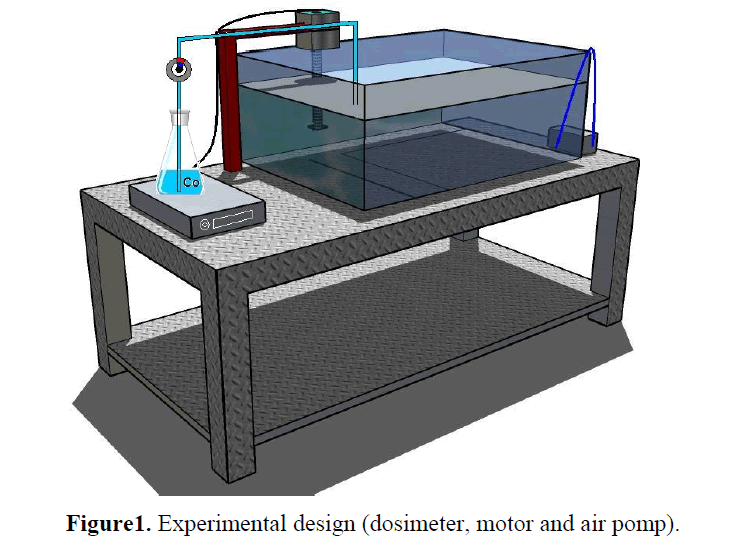 Prior to the experiments, each aquaria were continuously mixed by motor (see Figure 1). Figure 1. Experimental design (dosimeter, motor and air pomp). CoSO4 salts were used for preparation of three different stock solutions (4000, 2000, 1000 ppm Co). Fishes were exposed for different times (1, 12, 24, 36, 48, 60, 72, 84, 96, 108, 132 and 180 h) in different stock solutions (4000, 2000, 1000 ppm Co) with different flow rates (0,5-1-2 ml//h) (see fig 1). 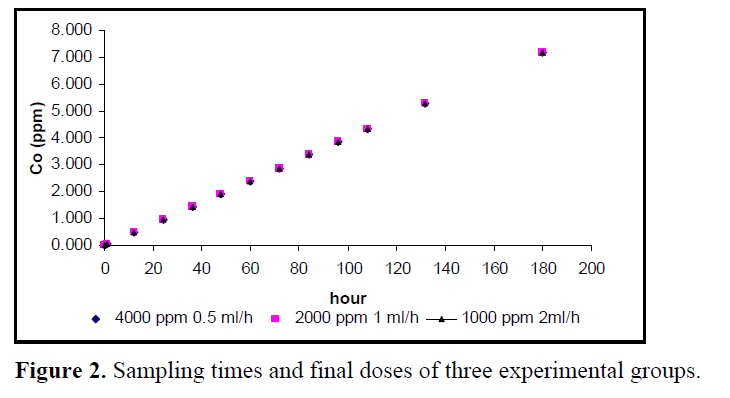 First experimental group was exposed to 4000 ppm Co at a flow rate of 0.5 ml/h, second experimental group was exposed to 2000 ppm Co at a flow rate of 1 ml/h and third experimental group was exposed to 1000 ppm Co at a flow rate of 2 ml/h. But, at all sampling period, all aquariums were equal Co concentrations (see fig 2). At the end of experiment time (180 h) all of aquarium Co concentrations were 7.2 ppm. Figure 2. Sampling times and final doses of three experimental groups. The total lengths of all fishes from each sampling time were measured using digital callipers in order to obtain an average length for that group (see table 1). The total sample was then placed into a 5 ml close polypropylene tube and placed into shaker for 24 hours at 30°C. All fishes had 1 ml of nitric acid and 1 ml percloric acids added and were left overnight on a cold digest (Güner 2007, 2008). The levels of Co, in digests were determined using flame atomic absorption (Unicom Model 929 AA) . The standards used to make calibration cue were 1, 3 and 5 mg\1. The SNK test was used to compare Co concentrations among replicates, Co treatments and time. As metal accumulation in replicate aquaria was not significantly different from each other, samples were pooled and a twoway Anova analysis was performed followed by a SNK test as a post hoc test. Groups were considered to be significantly different from each other if p< 0.05. All analyses were performed using an SPSS version 10.0 and MS Excel program. Table 1. Some described statics of weighs of fish in experimental groups. In an aquatic environment with Co inside, exposure of fish to this metal in water results in 50 % of the metal being associated with the skin and external organs, 30 % with the kidneys, and the remainder being evenly distributed throughout the body, whereas as a result of an uptake within food, only 30 % becomes associated with the external organs, and the remainder is uniformly present in other tissues (Coughtrey & Thorne 1983). Koyanagi et al. (1980) reported the major Co-accumulating organs in flounder Karejus bicoloratus as being the intestine (8 %), bone (9), liver (12 %), muscle (12%), skin (15 %), (l7 %), and head (20 %). Suzuki et al. (1979) reported that 75 % of Co in yellowtail Seriola quinqueradiata was present in the blood, viscera, and muscle. In this study, to avoid different accumulation in tissues, all body Co accumulation was determined. The natural concentrations of Co in fishes are very low and Co accumulation in fishes was not observed in areas where Co concentration in water was close to the background values (Moiseenko and Kudryavtseva 1990). During our experimental period Co accumulated in G. affinis body. Total body length and weight of all fish were measured, the average of groups, the largest and the smallest value was shown taple 1. Partial correlation coefficients was found between Co and total wieght as -0,5218 (P<0.001). In all experimental groups, accumulation of Co increased depending on time and with increasing Co water level (Table 2). Table 2. Co analysis results of experimental groups. Figures 3-5 show comparison between exposure times and body Co levels. 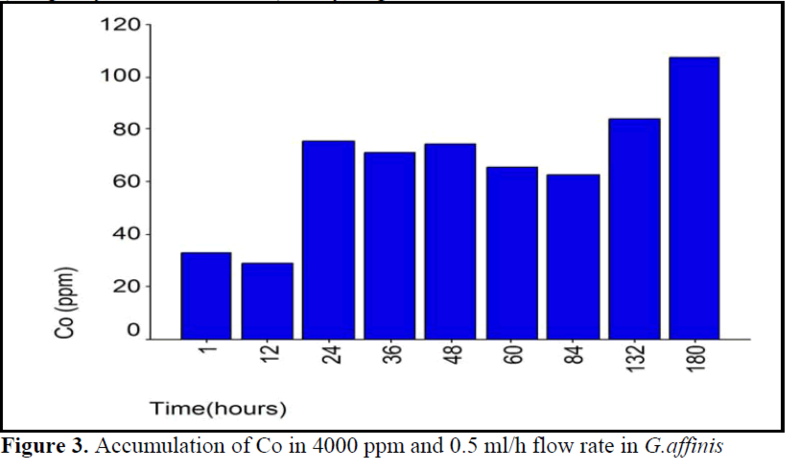 Accumulation pattern of 4000 ppm Co group with 0.5 ml/h flow rate indicated that there existed a step between 24 and 84 hours (see fig 3). Very high doses of Co (0.1-5 g Co kg-1) were toxic to rainbow trout, resulting in hemorrhages in the digestive tract and alterations in white blood cells (Watanabe et al.,1997). In this study, at the end of experimental period (180 hours), no mortality was observed in all groups. Generally, exposure of fish to cobalt in water results in 50 % of the metal being associated with the skin and external organs (Nolan et al, 1992). Co is essential as an integral component of vitamin B12 which is indispensable for fish growth (Miyazaki et al., 2001). Co was reported to accumulate in many tissues such as liver, gonads, and digestive duct (Nolan et al., 1992). Different fish tissues have got different Co accumulation capacities. In this study total Co accumulation in the body tissues were analyzed. The present results showed that there was no difference in the mean Co accumulation levels between some experiment periods; i.e. 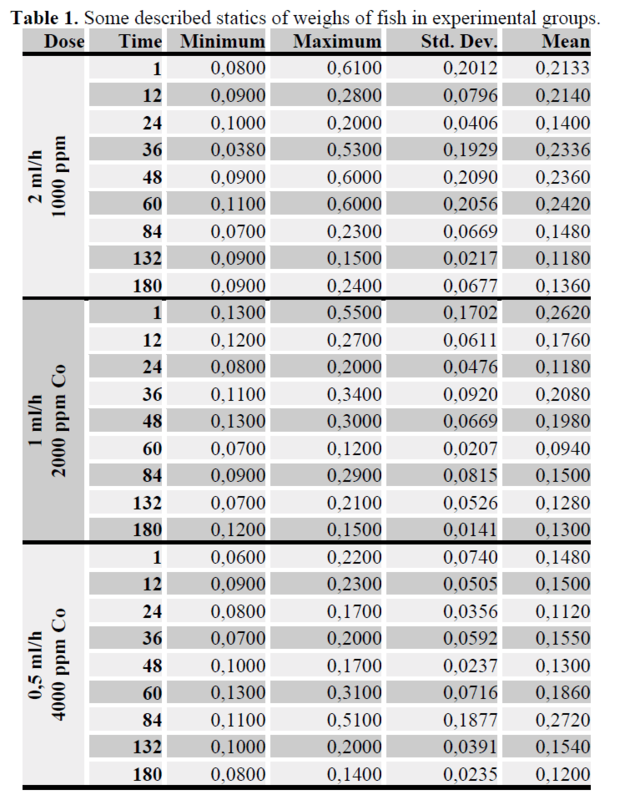 0.5 ml/h flow rate 4000 ppm Co concentration group between 24-48 and also 60-132 hours (see table 2). Marra et al (1992) reported that the temporal pattern of Co toxicity was different than Cu. 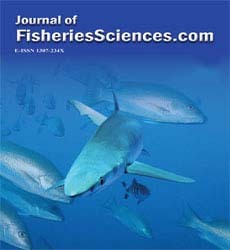 Cuinduced lethality occurred as early as the first 24 h of exposure, with most mortality occurring within the initial 72 h. In contrast, Co-induced lethality did not occur prior to 72 h of exposure, with the majority of toxicity observed between 72 and 192 h.
In this study, when three flow rates and Co concentrations groups were compared there were some similarities and differences between groups. First, because of accumulation pattern much uniform, 4000 ppm Co concentration group at 0.5 ml/h flow rate, accumulation showed different pattern. 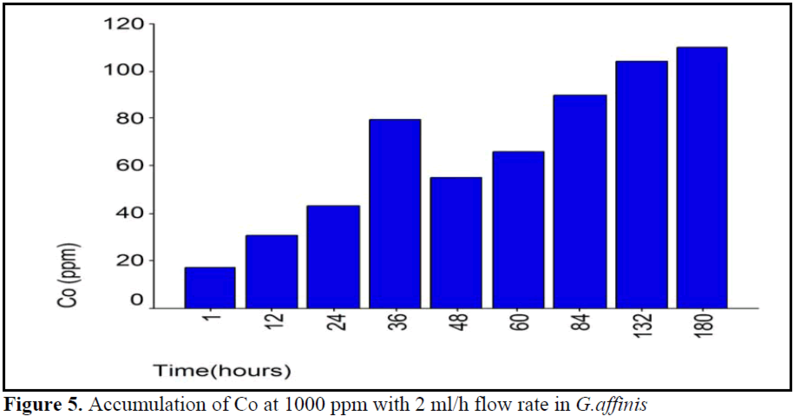 Second, the first two experiments period except, at first period of 1 ml/h flow rate of 2000 ppm Co concentration group, accumulation was showed a continuous increased. Co accumulation pattern was not much All of groups showed time depend accumulation pattern (see table 2). Because of the same final accumulation level at end of experiment period (180 hour) all of the groups showed similar patterns. In conclusion it appeared that three flow rates applied and Co concentrations did not affect Co accumulation in mosquito fish at the end of experiment period. The accumulation of Co in the fish body investigated increased depending on dose and time. However, accumulation of heavy metals at different flow rate more detailed in other heavy metals should be investigated. Baudin, J.P., Fritsch, A.F., (1989). Relative contributions of food and water in the accumulation of Co by a freshwater fish, Water Research, 23(7): 817-823. Coughtrey, P.J., Thorne, M.C., (1983). Radionuclide distribution and transport in terrestrial and aquatic ecosystems: a cntical review of data. Vol. 2. A. A. Balkema, Rotterdam, p. 191-217. Diamond, J.M., Winchester, E.L., Muckler, D.G., Rasnake, W.J., Fanelli, J.K., Gruber, D., (1992). Toxicity of cobalt to freshwater indicator species as a function of water hardness, Aquatic Toxicology, 22: 163–180. Kashiwada, K., Teshima, S., Kanazawa, A., (1970). Studies on the production of B vitamins by intestinal bacteria of fish-V. Evidence of the production of vitamin B12 by microorganisms in the intestinal canal of carp Cyprinus carpio, Nippon Suisan Gakkaishi, 36: 421-424. Koyanagi, T. Nakahara, M., Matsuba, M., (1980). Radionuclide accumulation by marine demersal fishes. In: Proc. 3rd NEA Seminar on Radioecology (Tokyo, 1-5 October, 1979). NEA/OECD, Paris, p. 313-222. Limsuwan, T., Lovell, R.T., (1981). Intestinal synthesis and absorption of vitamin B12 in channel catfish, The Journal of Nutrition, 111: 2125-2132. Marra, J.C.A., Hansenb, J. A., Meyerb, J. S., Cacelac, D., Podrabskyc, T., Liptonc J., Bergmanb H. L., (1998). Toxicity of cobalt and copper to rainbow trout: application of a mechanistic model for predicting survival, Aquatic Toxicology, 43(4): 225-238. Moiseenko, T., Kudryavtseva, L., (1990). The regularities of heavy metal accumulation in organ systems of fresh water fish and pathological processes. In: Lag, J. (Ed. ), Excess and Deficiency of Trace Elements in Relation to Human and Animal Health in Arctic and Cubarctic Region. Nordic Council Academy of Science and Letters. Roginski, E.E., Mertz, W., (1977). A biphasic response of rats to cobalt, Journal of Nutrition, 107: 1537-1542. Suzuki, Y., Nakahara, M,, Nakamura, R., Ueda, T., (1979). Iloles of foodandsea water in the accumulationof radionuclides by marine fish, Bulletin of the Japanese Society of Scientific Fisheries, 45: 1409-1416. Zwieg, R.D., Morton, J.D., Stewart, M.M., (1999). Source Water Quality for Aquaculture: A Guide for Assessment. The World Bank. Washington D.C. doi:10.1596/0-8213-4319-X.